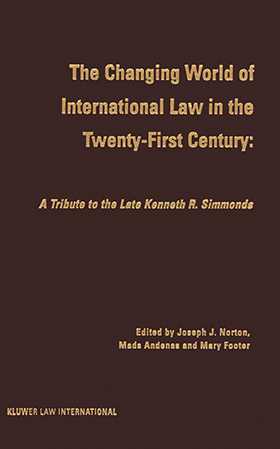 The Changing Nature of International Law in the Twenty-First Century draws together contributions of leading international legal scholars respecting major themes of the future of international law in the new century. The papers have been collected in honour of the late Professor Kenneth R. Simmonds, former Director of the British Institute of International and Comparative Law and Professor of Law at Queen Mary & Westfield College, University of London. The book is divided into three parts: Public International Law, International Dispute Resolution, and European and Other Regional Integration, which constitute the important themes and currents in international law today and in the future. The sections also represent the areas that were of personal interest to Professor Simmonds and in which he was a leading contributor until his death. This book will be of prime interest to international legal scholars or legal practitioners interested in the specific themes addressed within the volume.